Or delayed joining the gym because you wanted to get 'a little bit fit' or 'lose a few pounds' first? You know…avoided the thing that's actually going to help you because you felt embarrassed about your past behaviour or not proud of where you're currently at? 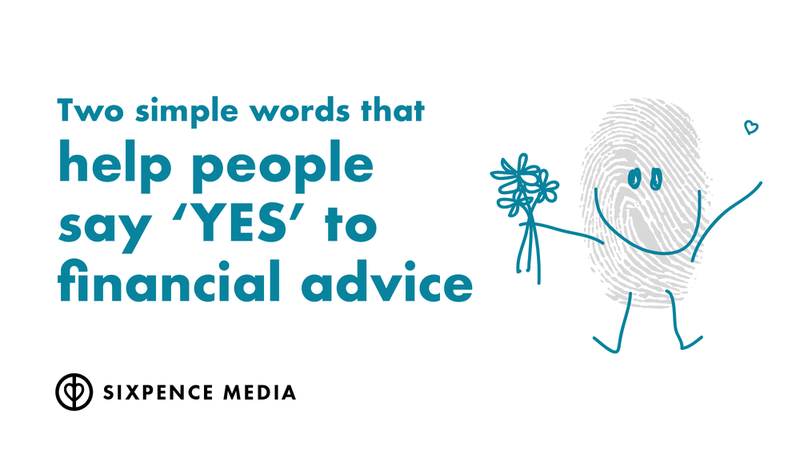 And I reckon it's the same for financial advice. There's a lot of Aussies who know they need to do something about their money situation. Things aren't where they want them to be. They feel stressed. They know they don't have things sorted. But they often also feel embarrassed about where they're at. There's shame, guilt, regret. A sense of failure. It's okay that things aren't perfect. It's okay to be right where they're at. It's okay if they made decisions in the past that didn't turn out so well. Tell them on your website, your social media accounts, and wherever you share your message with the world. Don't wait until they're sitting in front of you in your office. They need to hear it before then. And you don't have to use those exact two words — just get the message across. you make the people you're trying to help, feel guilty, ashamed, embarrassed and stupid. How do you think that might make someone feel? Like you're someone they can trust? Someone who can help solve their problems? Saying, 'it's okay' can create a powerful moment that helps people make a choice to change. Actually make a decision to take a next step. To say goodbye to the before and hello to the after. Saying, 'it's okay' shows you're human. It acknowledges we're all human. We make mistakes. We're not perfect. It creates connection. It's empathetic. It's kind. Show them you understand they're trying their best, even if that's different to your best.